The season continues at a fair rate. I knew that juggling my F1 commitments as well as a full season of World Endurance Championship (WEC) was going to be fairly gruelling. 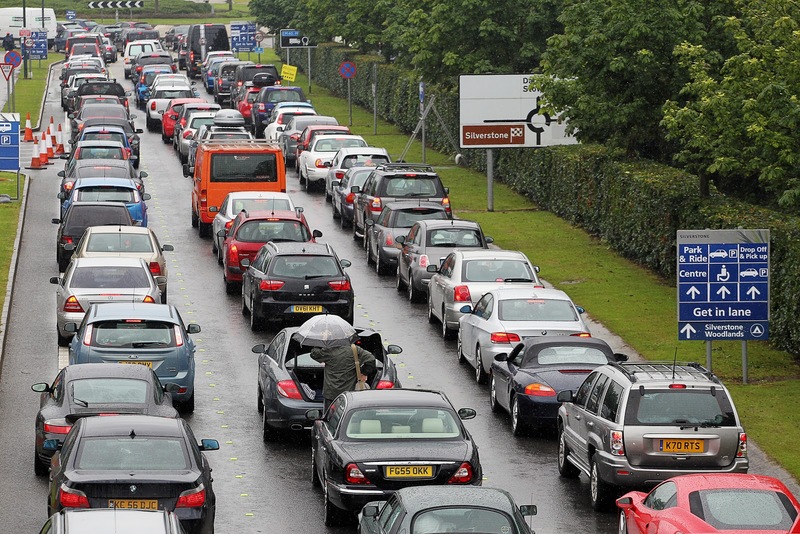 And that was before we even got to Le Mans! 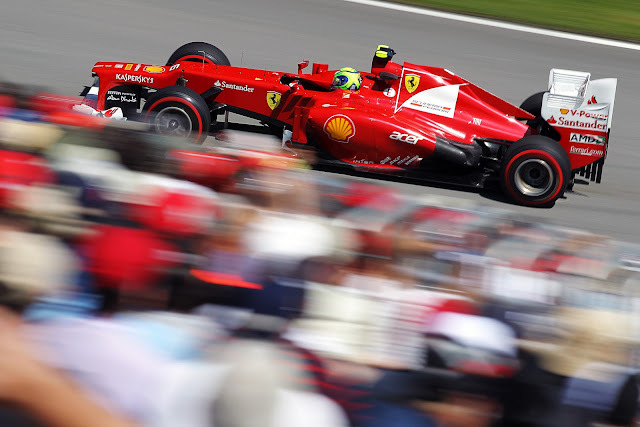 Canada is always a welcome trip on the F1 calendar. 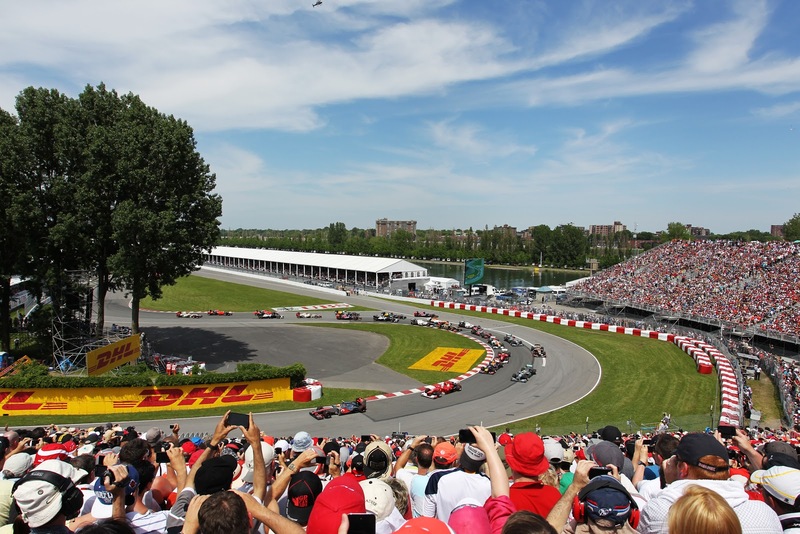 The city of Montreal comes alive as F1 enters town. The fans are well informed, passionate and come out in big numbers. The Gilles Villeneuve Circuit provides us with some good photo spots too. I am quite often asked by fans, where to go to take photos around each circuit and how to get access similar to the pro photographers, so avoiding the safety fences? Well Canada is a great example. I reckon 50% of my time at the Canadian GP is spent in the grandstands with the fans. I even decided to photograph the start this year from the turn 1 grandstand. It gives a great scenic view of the circuit and the colour and drama of the fans adds to the image. This photo below was also taken at the same location. Using fairly standard photo kit, a mid-sized 200mm lens, it goes to show the type of image fans can achieve with a bit of trial and error. The Canadian GP always somehow manages to clash with some large sporting event every year. I remember 2 years ago arriving and trying to figure out why every single resident of Montreal had packed into bars to watch whatever the 'Stanley Cup' was..... in the past we have packed into team hospitality areas to glimpse a view of England yet again being knocked out of the Football World Cup, and I always enjoyed arriving on a Sunday morning to watch the final few hours of the Le Mans 24 hours. This year however it was the Euro 2012 Football. Germany met Italy in the semi-finals and football fever had gripped the paddock. 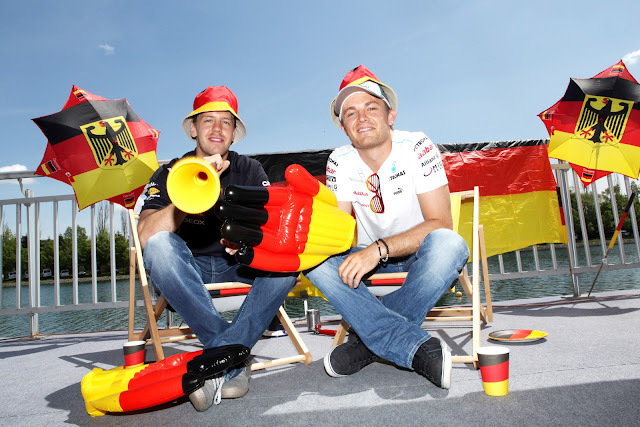 An exclusive photo shoot was set up for my colleague and a nice informal image of Seb and Nico for the German media. The British media however were still gripped with Lewis Hamilton. His relationship with his team mate, his girlfriend and his iPhone getting more column inches than it really needed. An emotional win however proved a point for 24 hours at least. Minutes after this photo above was taken I was on the road to Le Mans.... I had a deadline to meet. 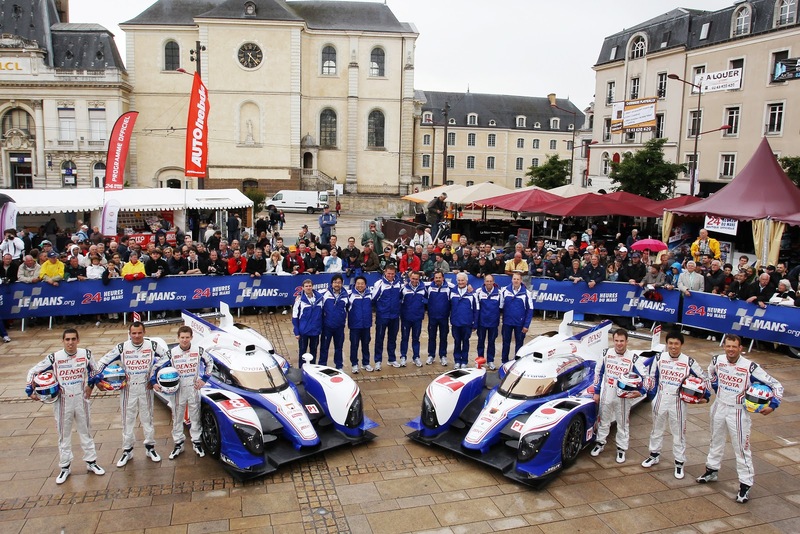 It is traditional that all teams pose for a team photo at the official scrutineering in the centre of the Le Mans town. I knew that Toyota were the last to go through which gave me until 2pm on Monday to get there. So a mad rush to the airport, a flight to Paris, pick up my car which I had already dumped at Charles de Gaulle airport and then a quick drive to the circuit accreditation centre and on to find somewhere to park in Le Mans town. I managed to arrive with about 3 minutes to spare. The 2 TS-030 cars were just being wheeled into place, I barged my way to the front of the photographers gantry and bingo the shot was in the bag!......Toyota were back at Le Mans! 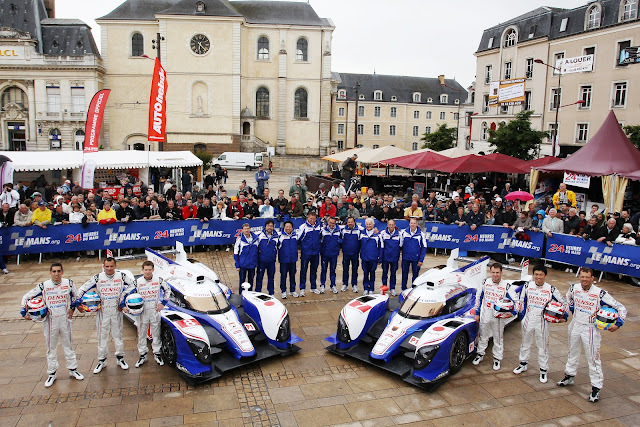 Toyota's story at le Mans has been well covered, but what a return, and I am sure that they will be fighting with Audi for the win in 2013. Typical European summer weather greeted us at Silverstone, with a re-hash of the muddy field issues of previous years. Fans were turned away, those that did make it spent hours queueing to get in. As this is my home race I am lucky in the fact that I know the small back roads and never really meet any traffic difficulties, I felt very sorry for the fans but also the race organisers who were up against the elements. Although not the most glamorous of photography I spent quite a bit of my weekend walking around muddy campsites and photographing queues of cars, as I knew this was going to be a big story of the weekend. The European part of the F1 season drew to a close with fantastic events in Germany, Hungary, Belgium and Italy providing some great races. 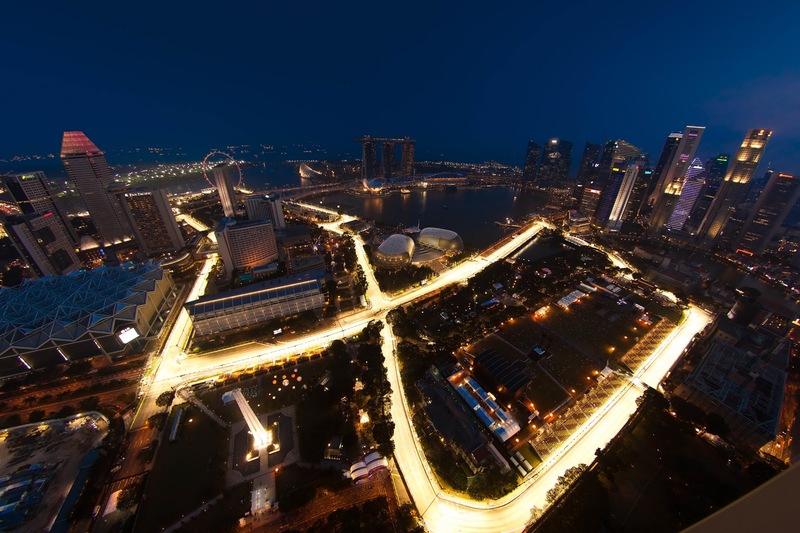 Singapore is one of the F1 photographers highlights of the year. The tight street circuit offers us a great backdrop and the artificial lighting of the night race gives us a chance to experiment more than normal. As usual with street circuits we attempt to get some unique views of the track offered by the surrounding buildings. This shot is taken from the top of the Swiss Hotel, one of the highest buildings in Singapore and gives a surreal view of the illuminated track at night. The Singapore race is unique for us in logistical terms too. 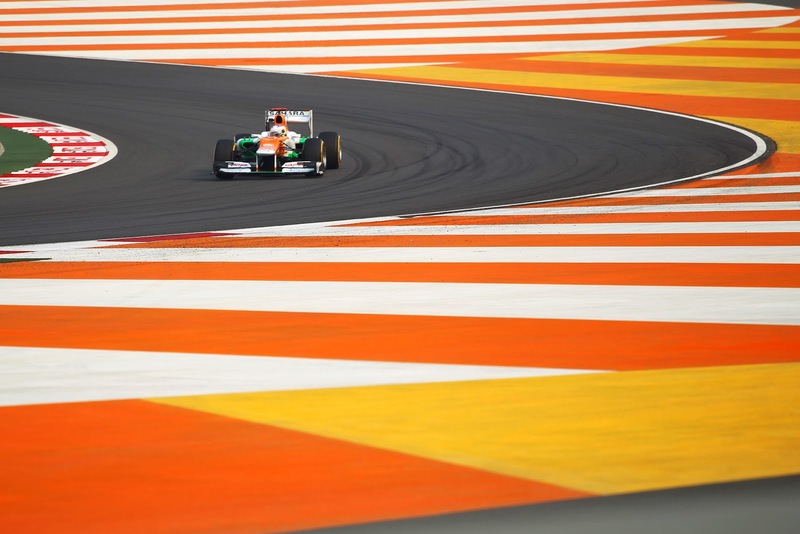 We try and stay on a European time zone, as most of the practice, qualifying and race is conducted at night. Working until around 3am, then heading out for dinner, before going to bed as the sun comes up is a welcome relief to the usual timetable. 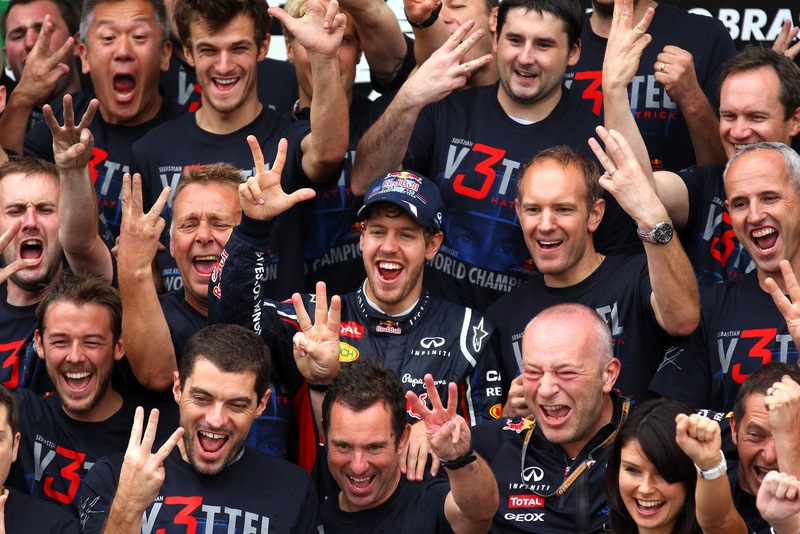 Seb Vettel was back in dominant form and in Japan I decided to position myself above the parc ferme for the end of the race, it is always a bit of a gamble and most of the emotion is better captured on ground level, but it does occasionally pay off. This time myself and a few other photographers lucked in as we shouted down to Seb, he looked up and gave the infamous winning finger! My constant circumnavigation of the World continued into the busiest part of the year. 8 non-stop trips in a row, from Belgium, Italy, Brazil, Singapore, Bahrain, Suzuka, Fuji, India and on to Abu Dhabi. India has become one of my new favourite races. I love Delhi, I love the colour, craziness and happiness of the local people. The circuit itself is good too. Even getting to work is part of the fun. Its a very busy weekend for us, with our Force India connections, and the local interest is fantastic. 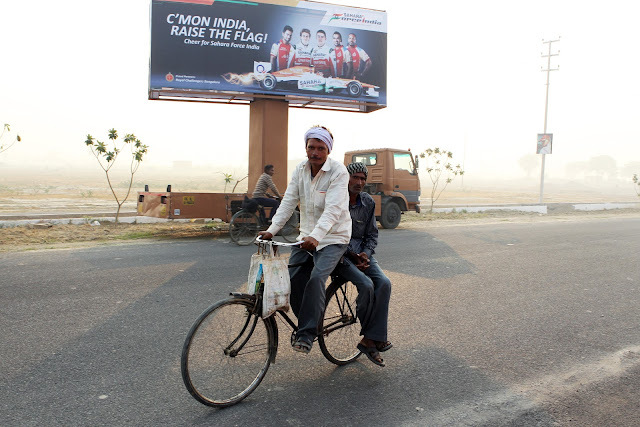 It's also nice to see our images used on local billboards and advertisements around Delhi. A few days sightseeing around Delhi provided some much needed life away from the circuit before heading to what I still regard as the best motorsport facility in the World, Abu Dhabi. 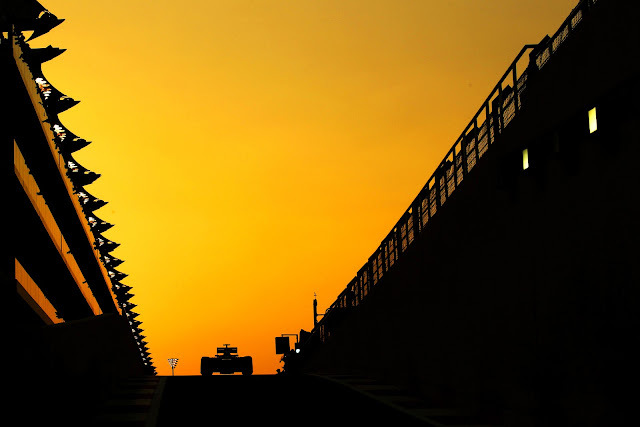 When they created this track they were not scared of out-shining their more glamorous neighbour Dubai and have thrown money and innovative design at this phenomenal track. The stunning backdrop of the Yas Hotel combined with yachts and orange sunsets just makes this place a joy to work at. For me the excitement of the year was reserved for Austin, Texas. 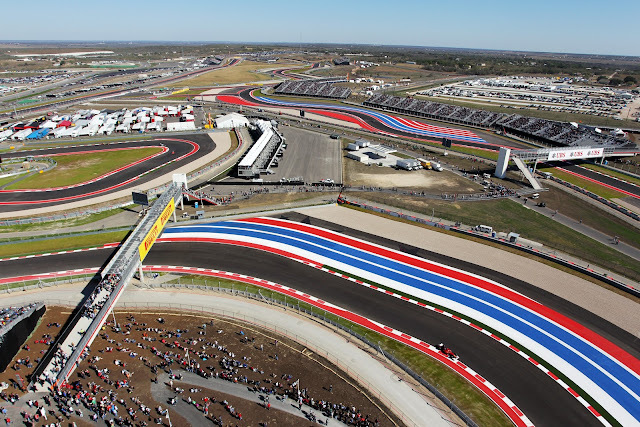 Many of the F1 crews had little experience of the USA. In my case I remember leaving Indianapolis back in 2005 having let the fans down, we (as F1) failed to show America what the sport could offer. 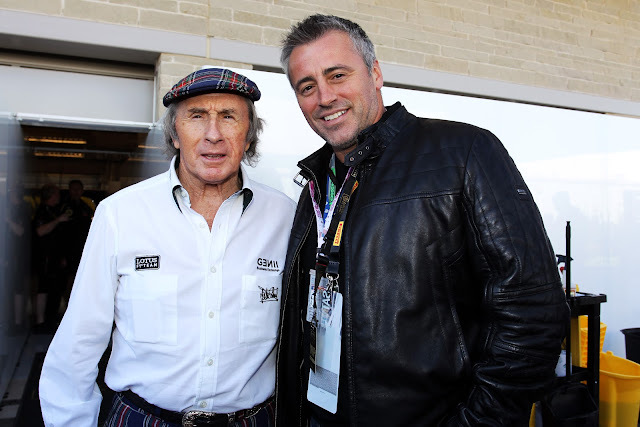 We knew Austin had built a great track and were looking forward to the race arriving, but nothing could have prepared me for the genuine warm welcome, the enthusiasm of the crowd, the celebrity turnout and the wonderful hospitality of Texas. And so the season drew to a close. I headed to Sao Paulo for the second time this year to cover the Championship showdown. 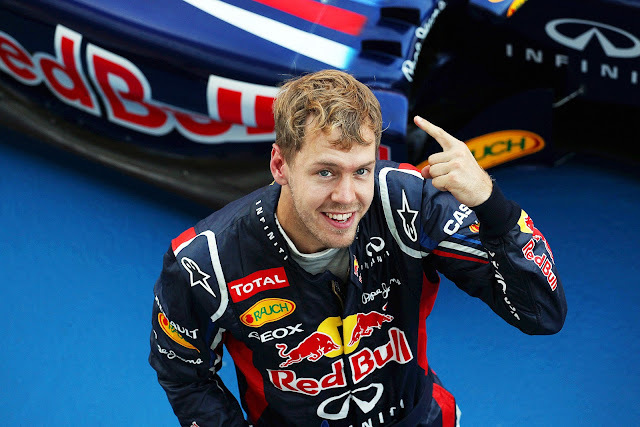 Brazil has been the home to many Championship deciders in my career. I love the circuit, and the South American vibe. From a photographic point of view race day of a Championship decider is a tense moment. You have no idea what is going to happen, where the action may take place, and you have a constant felling that you may miss a very important photo. As a team of photographers we plan the race in detail, all possibilities, in the hope that we will provide the best photographic coverage possible. No matter how many doubts you have it actually always comes together well in the end. 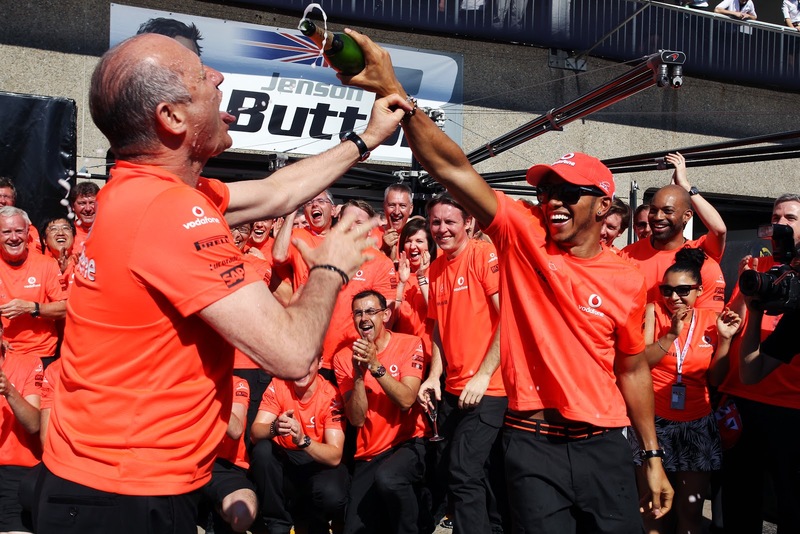 Sebastian won, Fernando was gracious, Michael retired and the fantastic 2012 season was over! Thank you so much to everyone that has been part of 2012. The teams themselves and specifically our fantastic clients. Thanks also for the help that we get from the numerous press personnel, the friendship of fellow photographers and media, assistance of circuit organisers, and all the fans that follow this great sport. The New year has passed and the 2013 season is around the corner. We will be on the road again in a few weeks providing coverage of launches, testing and the new F1 season. My New Year resolution. 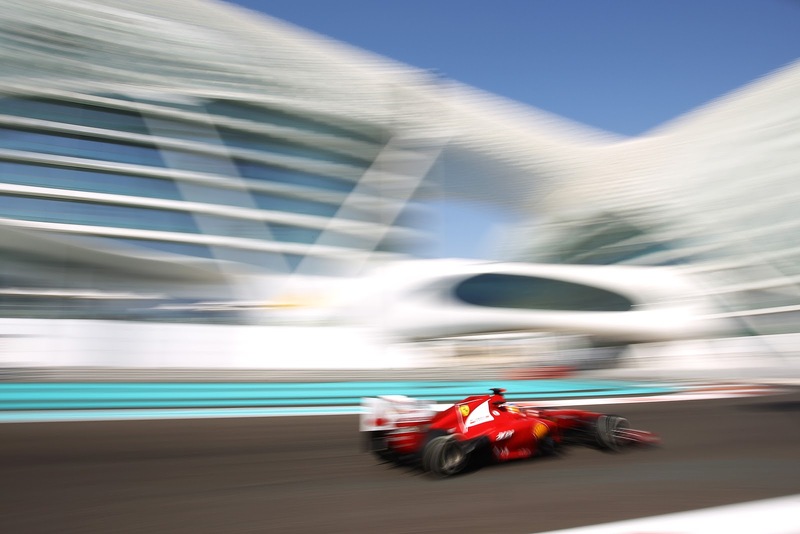 To provide more blogs and to give the numerous followers of F1 better behind-the-scene access at each event.